The mounting number of jobless people around the world has climbed to an historic high with nearly 212 million unemployed last year – or 6.6 per cent of the global workforce – and the situation in Europe is likely to worsen before it gets better, according to a new United Nations report. In its annual Global Employment Trends report the International Labour Organization (ILO) estimated that 34 million more people joined the ranks of the unemployed in 2008 and 2009, pushing the total number of out-of-work adults to a record high. The report painted a gloomy assessment for the labour market this year, predicting that unemployment figures will remain high through 2010 with an additional 3 million people losing their jobs in the European Union (EU) and other developed economies, while unemployment stabilizes or declines only slightly in other regions. “We need the same policy decisiveness that saved banks now applied to save and create jobs and livelihoods of people,” said ILO Director-General Juan Somavia, ahead of the annual World Economic Forum gathering in Davos, Switzerland. The ILO report said that despite coordinated stimulus measures worldwide that helped avert a far greater social and economic catastrophe, the number of unemployed youth increased by more than 10 million in the last two years – the largest hike since 1991 – and millions of women and men are still without a job, unemployment benefits or any viable form of social protection. The report also stated that some 633 million workers and their families were living on less than $1.25 per day in 2008, with as many as 215 million additional workers at risk of falling into poverty in 2009, underscoring the urgency of establishing wide coverage of basic social protection schemes to cushion the poor against the impact of fluctuations in economic activity. 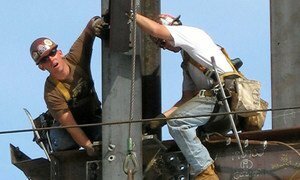 A premature withdrawal of national economic stimulus packages could delay a jobs recovery boon for years and throw 40 million more people worldwide on to welfare, a new United Nations report warned today.